Byzantine Empire, also known as Eastern Roman Empire, was a powerful civilization with origins that can be traced to 330 AD, when the Roman Emperor Constantine I dedicated a “New Rome” on the site of the ancient Greek colony of Byzantium. Though the western half of the Roman Empire crumbled and fell in 476 A.D., the eastern half survived for 1,000 more years, spawning a rich tradition of art, literature and learning and serving as a military buffer between Europe and Asia. The Byzantine Empire finally fell in 1453, after an Ottoman army stormed Constantinople during the reign of Constantin e XI. Every Byzantine emperor minted their own coins, from Constantinople, the capital. The other mints in major provinces are Italy (Ravenna), Sicily (Syracuse), Anatolia (Antioch) and North Africa (Carthage and Alexandria). 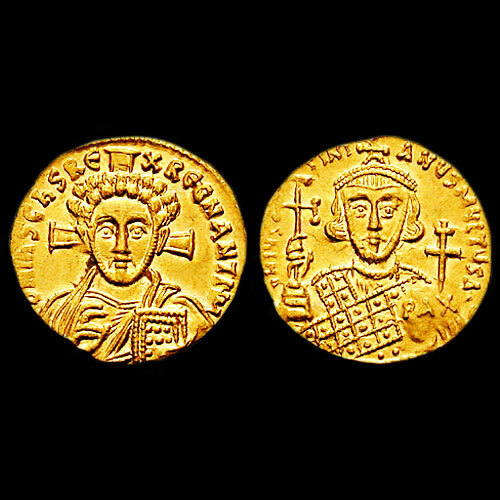 Byzantine currency consisted of mainly two types of coins: the gold solidus and a variety of clearly valued bronze coins. Early Byzantine coins continue the late Roman conventions: on the obverse, the coin depicts the head of the Emperor and the reverse usually have a Christian symbol such as the cross, bust of Christ or a victory or an angel.